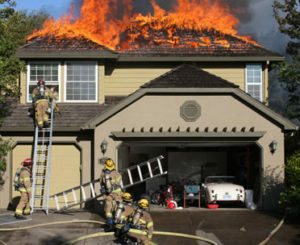 One of the most horrific things that can happen to a Homeowner is fire damage. Equally horrific is after the fire, the ordeal that a Homeowner is put through to get their home and life back together. Unfortunately, there are more horror stories on this subject than all other aspects of home ownership. After over 30+ years in this business, I have had my share of dealing with good and bad Insurance Companies when it comes to these types of losses. I have even set up a separate company “SBC Restoration “ to specifically deal with these kinds of insurance issues. So sit back, relax, and let me tell you what you are in store for if you are the victim of a fire loss. I will use, as an example, a project I did a few years back. The names are not important, but their story is very typical of what can, and generally does happen. The Homeowners were out of town when a lightning bolt hit their two story home and caused the second floor to catch fire. A neighbor called the fire department, and after the firemen flooded their second floor with water, were successful in saving the first floor of the home. The roof was totally consumed in the fire as well as most of the second floor. Their Insurance agent indicated that they were covered and that they should go and get three contractors to give a quote to put back the house. The agent also indicated that they were covered for contents (clothing, furniture etc…) and they should make a list of all items destroyed, along with their value, so that the Insurance Company could repay them for the loss. The Insurance Company also told them to find accommodations, like a hotel or motel which the Insurance Company would pay for, while their house was to be repaired. At this point, you the reader are probably thinking that this is a reasonable request and it should be relatively easy to comply with the Insurance Company’s wishes. But think about what is being asked of them. They need to find immediate lodging, retain or go purchase new clothes and basic items, get three contractors to bid the work, and make an inventory of all the items in the home that were damaged or destroyed. And by the way, go about their daily lives of work, school, etc…How would you feel in their position? Let’s take the issues our Homeowner needs to address and look at what happened as well as what should have happened. How many of you actually know all the items (contents) and prices in your home? How many of you can name and price ½ the items in your home? How many of you can probably name and price 20 items in your home? This is a huge problem for 99% of us, and the Insurance Companies know this. So most of us just throw up our hands and say to give me an average for my style of home in my kind of neighborhood. If you leave it to the Insurance Co., they will naturally assume a lower number that you probably have in mind. Unless you can document your loss, the Insurance Company is under no obligation to pay you for something you said you had, but have no proof you purchased it. Remember that the Insurance Company’s sole purpose is to pay, within the law, the minimum required to get you to release the claim. Some Insurance Companies will help you to establish this, but the more you can prove, through photos, receipts etc.. The better they can serve you to get a fair amount on your claim. The Homeowner needs to document their contents before a disaster occurs. With digital photography this has become a lot easier to accomplish. This is what I have done on my home. It took me 2 hours to go into every room and photograph each dresser; drawer, nook, and anything that looked like it need to be remembered. I then made a disk and placed it in my safety deposit box away from the house. I also photographed the exterior. For those who want to go further, you can actually make a list and categorize all your possessions and along with the photos, you will be well prepared in the event of a loss. Here is the subject I know the most about and am willing to depart my wisdom and experience. In my opinion, the absolutely wrong approach a Homeowner should take in an Insurance loss is to get three bids. We all have this 3 bid mentality hammered into our psyche, but in this case it does much more harm than good to the Homeowner. Most Insurance Companies would love you to go out and select 3 contractors to bid the work because that gives them an out when it comes to negotiating a final settlement. If you get three bids, guess which one the Insurance Company will want to take to start negotiating the final claim? You have lost all leverage over getting an equitable settlement because you picked the contractors and the Insurance Company will say that it assumes you picked reputable contractors. Also realize that the contractors you picked are put in a position of coming up with the lowest bid so that they can get the job. They are not going to confront the Insurance Company, who has the money, because they will be quickly dismissed if they try to add questionable items that you should be entitled to. Let me backup and tell you another significant fact. While you are doing your thing with the contractors, the Insurance Company has hired or has on staff, an Adjustor that will come to the home and assess the damage for the Insurance Company. Remember that the Adjustor is working for or is employed by the Insurance Company. Their allegiance is with the Insurance Company, and they derive their pay from the Insurance Company. How much impartiality do you think they have when it comes to putting a dollar amount to your damage? Their price to restore your home will be roughly ½ to ¾ of what we ultimately settled the final claim for. All right, so what does one do to protect oneself from being taken advantage of. What I promote is at the onset of this process is for the Homeowner to not get three contractors, but rather get one contractor/expert that is solely on the Homeowner side and will act on the Homeowner’s behalf in negotiating with the Insurance Company to obtain a settlement. Let me give you some examples, based on my example of the second floor fire, of why this process is in the best interest of the Homeowner. The second floor flooring was carpet, so you would naturally assume that the Insurance Company has to pay for the replacement of the carpet. The Insurance Company is required to pay “like and kind” for any damage done to the home. Now I am going to tell you that there was hardwood flooring under the carpet. Our position was that not only did the Insurance Company have to pay for carpet, but also for hardwood flooring as well. Another example was windows. Remember I said that the Insurance Company had to pay for “like and kind”. Well the windows were old style single pane windows that obviously we were not going to put back, but rather we wanted to install a new insulated window which naturally costs more. The Insurance Company agreed that “like and kind” in this case would be best served with a new insulated window, but we were faced with another dilemma. The first floor windows, which were not damaged, would have to remain. This would have looked stupid to have the second floor windows all new and the first floor old, so what did we do? After we settled with the Insurance Company, we took the money from the hardwood and used it to get new windows for the first floor. One final example. This one is the most important in whom the Homeowner chooses. The second floor was where the water came in, but the first floor ceiling got the major hit of water damage. Even though it was intact, there was mold growing everywhere and there were signs of major deterioration in the drywall. The Adjustor indicated that he was not willing to replace the drywall, but rather said to us he would pay for us to clean it and let it dry out before repainting it. Would you accept that in your house? Also there were charred wall studs that the Adjustor said were structurally sound and that he would pay for only sealing the charred wood. Would you accept that in your house knowing that every time it rains or gets humid that the smell of charcoal will permeate the house? Remember in the three contractor bid scenario, they would be forced to abide with the Adjustor’s wishes. We, on the other hand, being experts, convinced the Adjustor and the Insurance Company that it was not acceptable because it was not in the Homeowner’s best interest . All in all, our initial projected amount of loss that we presented to the Insurance Company was for $152,000. The Adjustor’s initial determination of loss was $84,000. After two months of negotiations, we settled for the amount of $ 138,000. Had the Homeowner settled with the Insurance Company for the $84,000, the Homeowner would have had to live with recurring mold on the ceiling, the smell of charred wood every time it rained or was humid, and windows on the first floor that looked different than the ones on the second floor. When you obtain Insurance, most people don’t think about the policy having time limits. There will be a limit for contents, so if you have those gold plated golf clubs, you better insure them individually as an itemized item. There is a limit for construction dollars. If the amount of damages for your home exceeds the limits of your policy then it is considered a total loss and the Insurance Company is just obligated to hand you a lump sum check for that limit and walk away. It then becomes your problem as to how to rebuild. There is also a limit for living expenses. If the negotiations for the settlement of your construction drags on too long, then the Insurance Company will politely tell you that you have X amount left in your living expenses before they are no longer obligated to pay under your policy limits for your living expenses. Most people assume there is an unlimited amount, and until the project is finished being rebuilt, the Insurance Company will continue to pay for your living expenses. The Insurance Company is only obligated to pay up to your policy limits for living expenses. So beware that the minute the claim is called in by you, the clock is ticking. Some Insurance Companies are more sympathetic than others in settling a claim. There are a few Companies and a few Adjustors that I have met over the years that are very fair minded persons and truly try to help. Next, I want to reverse the comments and say that there are some Homeowners that try to obtain funds from the Insurance Companies that they are not really entitled to. This is also a fact of life that we all must recognize. Finally there are also Homeowners that see all this money being spent on their behalf that try to keep some for themselves. The particular instance I am referring to is the contractor overhead and profit portion of the settlement. Some Homeowners feel that they can do the repairs themselves and think that they can pocket the contractor’s overhead and profit portion of the settlement. This is a very dangerous activity for the Homeowner to be involved in. First and foremost I must tell you that Insurance Companies discourage this practice by having a policy that if a qualified contractor is not used to reconstruct the project then the Homeowner does not have the right to receive the contractor’s overhead and profit. So you Homeowners out there that want to do your own construction and take the money and run take heed. You are not entitled to contractor overhead and profit of the overall settlement. Remember that the Insurance Company’s first obligation is to protect the investment of the home and discourage the Homeowner from becoming a do it yourselfer. As always, we at the Stan Better Family of Companies are always here to help you in your time of need. We have the ability to act on your behalf. To fight for the Homeowner’s best interest to get a fair and equitable settlement. We are not on any Insurance Company’s “preferred list” therefore we have no allegiance nor will we be intimidated by an Adjustor or the Insurance Company. We have Architect/Contractor experts to assist in providing expert opinion in the negotiations. We have the special computer programs that the Insurance Companies and the Adjustors understand and prefer. And we have the construction company “SBC Restoration” capability to build the project back the right way. I hope it never happens to you, but if it does, or if you know of someone that might need our services, I hope you will give them our name.